What if business officers could start over again to create an effective model of financial reporting that more clearly describes college and university finances? That’s the essence of the NACUBO Accounting Principles Council’s “Blank Slate Project,” a new approach described here. First in a Series To explain more clearly the costs of operating their institutions, college and university leaders need a unified reporting model and a common language of understanding. And in fact, communicating the cost and value of higher education to the public is one of the goals in NACUBO’s 2014–16 long-range strategic plan. In a series of articles that will run through the spring, Business Officer explores efforts under way by your association to clarify the busi­ness of higher education. Imagination . . . that creative ability to form a wholly new notion of something—an ability not typically associated with financial accounting and reporting. Rather than capacity for free-ranging thought, financial reporting probably calls to mind such concepts as confinement, perhaps boundaries related to rules, maybe even compliance. For those who prepare financial reports, it may seem that the most innovative events they encounter are implementations of new accounting standards—which come with requirements that may add little incremental value to the financial statements. Yet, financial statements are fundamental to understanding a college or university’s financial performance and health, as well as how the institution operates and how efficiently it is fulfilling its mission. How can these statements best serve as the foundation for understanding by stakeholders and the general public? In an effort to enhance reporting for all types of nonprofit organizations, over the past three years the Financial Accounting Standards Board (FASB) has been looking at the not-for-profit (NFP) reporting model. Through its NFP Advisory Committee (NAC), the board and staff have been researching, discussing, and engaging constituents on a quest to improve how NFPs—including private colleges and universities—can better tell their mission-related stories and help users understand annual operating results. The effort is by no means an overhaul of the NFP financial reporting model, but rather the objective is to provide meaningful enhancements to the current model. The NFP sector is large and diverse: health care, charities, foundations, religious organizations, membership associations, fundraising entities, museums, higher education institutions, and more. Continued challenging economic times have put pressure on all of these organizations. Higher education is no exception. In fact, a particularly bright spotlight has been shown on the performance of colleges and universities. Consequently, NACUBO believes that higher education is in a prime position to step back and evaluate what financial reporting must convey to address those concerns. Although higher education already has a voice in NAC meetings and NACUBO regularly talks with FASB staff, members of NACUBO’s Accounting Principles Council (APC) felt that something more thought-provoking was needed to inform and influence FASB’s effort to improve financial reporting. Because financial reporting doesn’t regularly change—the current model has been around for two decades—the APC saw a rare opportunity to put forth a model that makes sense for all of higher education. If accountants could start from scratch, what might the financial statements of a college or university look like? This question was the genesis of NACUBO’s “Blank Slate Project,” a name arising from the desire for a clean or new beginning. The project has parallel goals: (1) influence the accounting standard setters, and (2) create a product that underpins and conveys financial performance and accomplishment in the clearest possible way. Even though the impetus behind NACUBO’s Blank Slate advocacy effort was FASB’s reexamination of the NFP reporting model, the APC intended that the Blank Slate model should apply to both independent institutions that follow FASB and public institutions that follow Governmental Accounting Standards Board (GASB) standards; after all, higher education is one industry. Within that industry, many types of colleges and universities are represented: liberal arts, technical, specialized, community, research-oriented, graduate degree-focused, public, independent—and any of these can be large, medium, or small in size. Nevertheless, the industry is divided according to the legacy of predominant support: public institutions (state government-supported) that follow generally accepted accounting principles (GAAP) promulgated by the GASB, and independent institutions (primarily privately supported) for which GAAP is defined by the FASB. Higher education is one of two significant industries that are split in this way; health care is the other. NACUBO’s APC felt it was important for both standard-setting boards to hear and see a new idea of a reporting model that tells the higher education financial story. Anytime one has a seat at the table with the accounting standard setters, it’s an opportunity to influence. So why not help the boards see that U.S. GAAP could possibly be uniform for higher education institutions? After all, both boards believe that financial information reported in an entity’s external financial statements should be decision-useful. 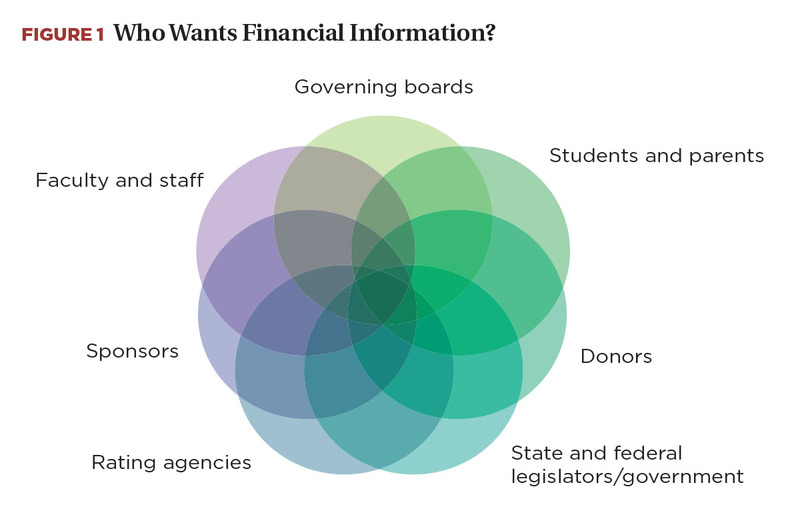 Even though state legislative bodies make different types of financial decisions for public institutions, the decision-usefulness of financial information for either a public or independent higher education institution should be based on similar meaningful themes; a statement’s significance should not be GASB- or FASB-dependent. In the Blank Slate reporting environment, an entity’s story is told within the context of its financial resources. The goal is to clearly explain annual operating results, resource stewardship, and the educational environment. Audited external financial statements are at the heart of higher education fiscal intelligence sought by specific stakeholders and the general public. Who are those users? Stakeholders include rating agencies, bond underwriters, creditors, investors, legislators, donors, grantors, the media, faculty and staff, and parents and students. Diverse use, potentially widespread consumption, and the public emphasis on the higher education industry—from the White House and Congress, federal agencies, state governments and legislatures, think tanks, analysts, researchers, national and local media organizations, and others—point to the importance of communicating effectively through external financial statements. Many sources of financial information are publicly available, including the Department of Education financial responsibility scores, the Integrated Postsecondary Data System’s (IPEDS) finance survey, the College Board’s reports, the Delta Cost Project’s publications, and financial schedules that are part of the Forms 990 and 990T. All ensuing facts and figures begin with the financial statements—because all sources of information start with the same data that are the basis for the financial statements. All subsequent presentation and analysis depend on the focus of the various users. NACUBO believes financial reporting must be grounded in standard principles of accounting so that the data are fundamentally reliable. That reliability is critical, as the numbers are used in a multitude of ways, and users assume comparability. In a sense, the Blank Slate Project contemplates whether some industry specificity in GAAP would be helpful. Keep conversations GASB- and FASB-neutral; don’t quote accounting literature! Resources instead of net assets. Used or transferred instead of released from restriction. What Do Users Want to Know? When reflecting on the various elements stakeholders consider necessary to understand how colleges and universities function, the Blank Slate team found that the output became a distilled series of questions. What may seem basic to higher education business officers can often be enlightening to those outside the industry. The questions that follow are fundamental; however, feedback from FASB and GASB staff indicated that the questions were thoughtful and instructive. How are endowments created and how are donors’ wishes honored? How much is spent and how is that amount determined? Where is the endowment balance shown on the financial statements? How much of the endowment cannot be spent? What portion of the endowment is quasi (funds functioning as endowment) versus a true endowment (donor established)? Why can’t universities spend more, especially if balances are high? What would the college have to give up if it didn’t have its endowment? How do endowments (1) enhance programs, (2) affect fees for service, and (3) influence the budget? What ongoing obligations exist between the institution and the donor? How is the price of tuition determined? What is a tuition discount and how does financial aid affect tuition? Can financial aid be found on the financial statements? What is the relationship between financial aid and the tuition discount? What role does the government (federal, state, local) play in financial aid? Where does institutional aid come from? What is the relationship between various revenue sources and institutional aid? How does endowment spending relate to financial aid? Apart from tuition, what are the other major sources of revenue? What types of “fee for service” (exchange) revenue does the institution have? What types of support revenue (nonexchange) does the institution rely on? How do the various types of support revenue (contributions, grants, taxes, appropriations) influence mission-related activities? Does support subsidize the mission, or do fees for service subsidize the mission? How do external and internal designations (restrictions) impact service delivery? How does previously recognized revenue (support or fees for service) that is spent from reserves in the current year impact an institution’s operating margin? Should pledges (promises to give) be part of the current period’s earnings equation? How do institutions cultivate support revenue? How do “natural” expenses (salaries, benefits, utilities, supplies, professional fees, and so on) relate to programmatic or educational activities? What do the functional expense categories mean (e.g., instruction, sponsored research, student services, academic support, auxiliaries, and the like)? What are the educational activities? What is included in overhead and where is it found on the financial statements? To best tell the higher education story, the Blank Slate Project team began by thinking differently about the current net asset classes and restrictions. Everyone acknowledged that explaining restrictions is important; however, there was considerable debate over whether the external financial statements should reflect both donor expectations and governing board decisions that affect asset use. Ultimately, the team determined that both donor and governing board designations should be reflected in financial reporting. The Blank Slate environment focuses on resources: identifying what they are, where they come from, and how they influence the current and future viability of the institution. The current focus goes directly to the notion of explaining operating financial performance. The future focus speaks to purpose, stewardship, intergenerational equity, planning, and achieving mission-related objectives. What is a resource? Resources are transformed or used to carry out an entity’s mission, thereby benefiting the institution through their consumption or use. Benefits can include meeting service recipient needs, maintaining and developing necessary infrastructure, organizational expansion, and adding reserves for the future. So, buildings are resources, as are endowment investments, tuition revenue, research grants, or contributions. Higher education institutions are custodians and managers of such resources. Statement of changes in resources. Following is an in-depth discussion of each statement, along with illustrations of how they would look. NOTE: These statements are not required and, in fact, do not meet all the requirements of generally accepted accounting principles (GAAP). Rather, they are a means by which higher education can explain its unique qualities and needs to the standard-setting boards and other financial statement users. The APC team chose to use the generic title “balance sheet” for the first statement, because the term is widely understood. The balance sheet presents assets and liabilities (liabilities include deferred inflows of resources), in order of nearness to cash and obligation maturity, respectively. Although corporate and governmental entities classify the balance sheet, with current assets generally representing amounts that will be used or liquidated within one year, such a distinction becomes problematic for higher education institutions because restrictions must be factored into the liquidity equation. The team debated the use of a classified balance sheet, eventually deciding that there is too much imprecision in determining whether items are current or noncurrent for that format to be of value in understanding an institution’s resources. As team members discussed how best to tell the higher education story, they struggled with how to treat pledges (promises to give). There was general consensus that a pledge met the definition of an “asset,” but that it should not be recognized as revenue until there was an actual resource that the institution could use. To address this concern, the team decided to add a deferred inflow of resources (pledges pending receipt) to the liability section of the balance sheet, to flow pledges through the balance sheet and income statement in a way that comports to the results of operations. In the Blank Slate model’s balance sheet (see Figure 2), all pledges are displayed as assets (pledges receivable) with an offsetting deferred inflow of a resource (pledges pending receipt). These amounts are reported gross, net of an allowance for collectability. When a payment is received on the pledge, both the receivable and the deferred inflow are reduced. Payments on undesignated pledges are recognized as current support revenue on the income statement. Payments received on pledges that have donor designations are recognized as revenue once a threshold is crossed that allows the designated use—such as groundbreaking on a building, the start of a future academic year, or the ability to award scholarships for a new program. Undesignated. This resource category contains only amounts that can be used for any purpose. Designated. While donors may identify a specific use for their gifts, the institution’s board may also place designations on certain assets. The team felt that these internal specifications for long-term purposes such as capital improvements, bond repayment, and the like, were equally important to present, allowing a reader to truly understand the availability of resources. Accordingly, the designated resource category distinguishes between amounts with donor/third-party designations and internal/board designations. Helping users understand internal designations also accentuates the significant role of governing boards in higher education. Investment in plant. This resource category represents the amount of capital assets and related liabilities of an institution. These are an important part of an institution’s resources, and typically quite material in amount, but they are not liquid and can’t be spent. Endowment. An institution’s endowment, which is critical to its viability, is considered a holistic resource that is managed in total. Accordingly, the team felt that endowment totals should be prominently displayed on the face of the balance sheet, with additional detail in the footnotes. The endowment resource category consists of donor-designated, or true endowments, and board-designated, or quasi-endowments, as well as annuity and life-income funds for which a donor requires a specified amount be invested in perpetuity. To the extent that an endowment fund is underwater, the amount is reflected as a reduction in “Endowment gains (losses) for use in future periods” in the statement of changes in resources. 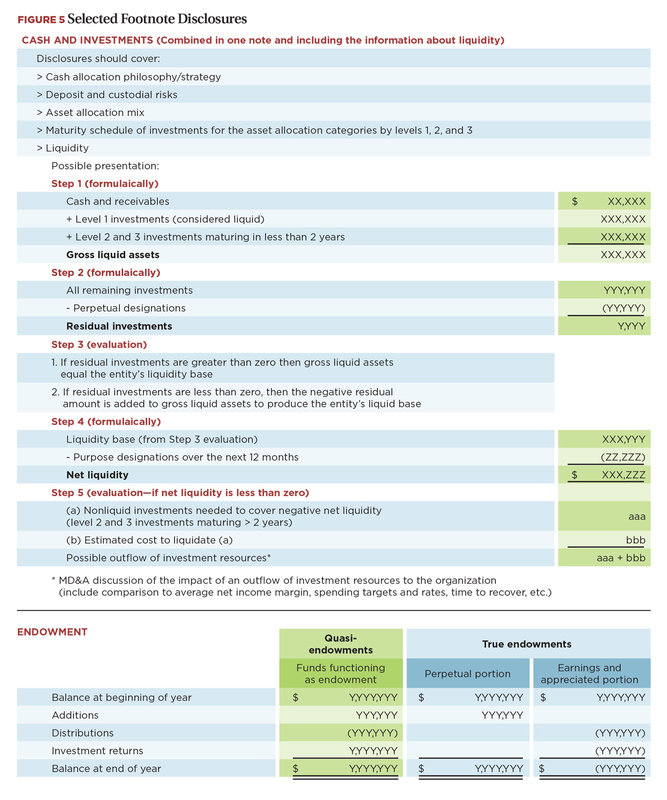 As with the balance sheet, the team chose to use the title “income statement,” as it is familiar to users of for-profit entities’ financial statements. 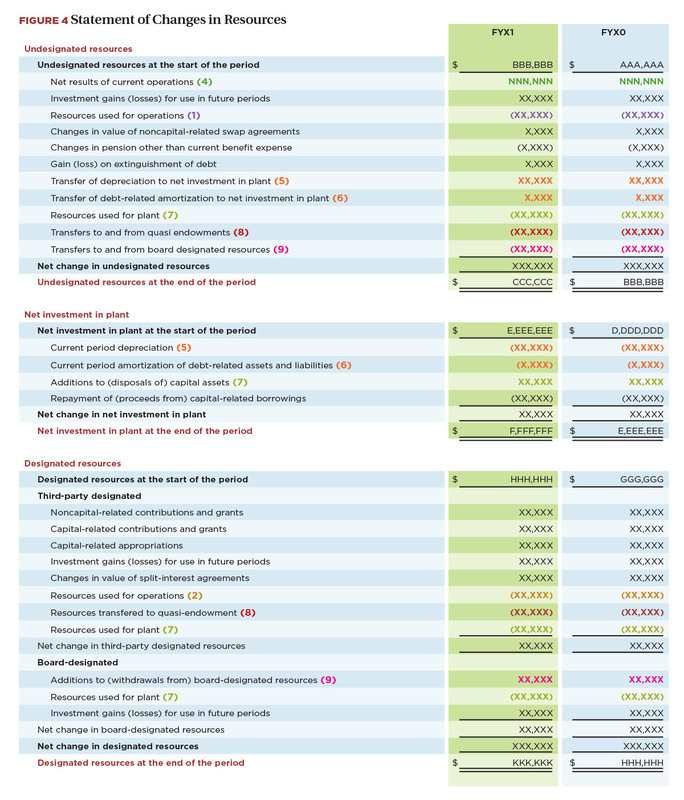 The income statement reports the results of current operations (see Figure 3). To help financial statement users understand the types of resources that colleges and universities generate and rely on, the Blank Slate model displays revenue in two categories: (1) fees for services (exchange), and (2) current support (nonexchange). The amount of detail displayed in these two groupings should allow users to understand how the institution funds its operations. In higher education, “operations” essentially means the fulfillment of mission-related activities in the current reporting period, and the means by which such fulfillment is accomplished. Revenue is a resource that can be earned, such as by providing a service in exchange for a fee. Revenue can also be provided by governments, grantors, donors, and sponsors for either general support or for designated mission-related purposes in the current reporting period or into the future. Operating expenses are shown by natural classification on the face of the income statement, because natural groupings—salaries, benefits, rent, utilities, supplies, and so on—are more easily understood by stakeholders. Again, the level of detail to be provided should take into account the specific information necessary for a financial statement user to understand the way the institution used its resources in fulfilling its mission. A matrix reconciling natural and functional expenses is included in the footnotes. The Blank Slate Project team also recommends that functional expenses be consolidated into programmatic groups that represent the institution’s mission-related activities. 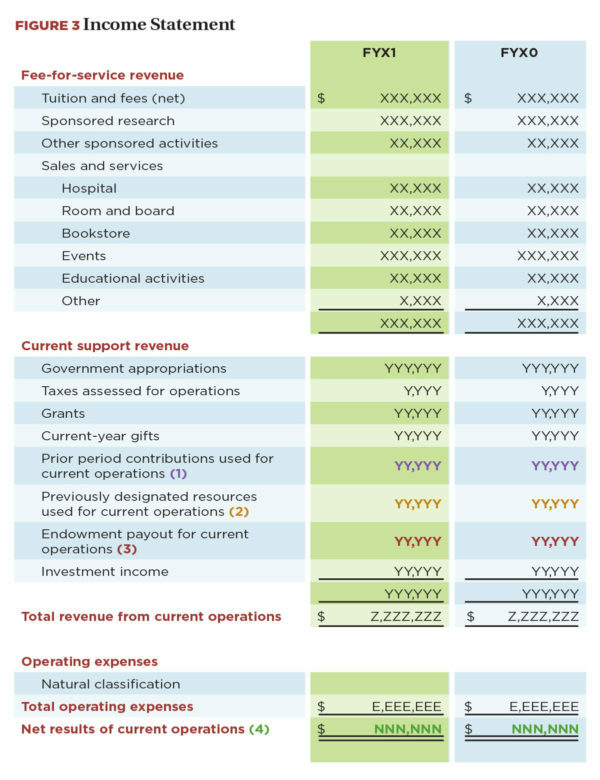 Colleges and universities can, and should, explain the types of endeavors included in their functional expense categories. The objective is to better explain to stakeholders the institution’s mission and related costs. The mission-related categories should contain all allocated overhead. Educational activities—instruction, student services, academic support, department research, and the like. Sponsored activities, such as research. Public service or independent operations, if applicable. In addition, institutions should disclose and explain the various forms of institutional overhead (e.g., central institutional support, advancement/development efforts, plant operation and maintenance, interest and depreciation). Institutions can also elect to display the amount of institutional overhead allocated to the mission-related programmatic functions. The statement of changes in resources (SoCR) is conceptually new as part of the Blank Slate project. This statement is used to explain how resources are assigned for use in operations, conserved for the future, consumed, or utilized to generate future resources. It essentially replaces the nonoperating portion of the current statement of activities, with details intended to help explain the “story” of the institution. Each of the four resource categories is shown separately and articulates to the balance sheet. The example in Figure 4 shows movement of resources to the income statement and among the resource categories. Note that the different colored references in bold track resource movement to and from various categories. For example, the increase in support revenue from endowment payout for current operations on the income statement corresponds to the reduction in the endowment resource category on the SoCR. Within the statement of changes in resources itself, note that current period depreciation and amortization of debt-related assets and liabilities are added back to undesignated resources and deducted from investment in plant. That is because those amounts are included in the net results of current operations, but should be reducing the institution’s investment in plant resources. The example in Figure 4 is very detailed so as to illustrate the types of activity that might be seen within and among the resource categories. The level of detail provided in the SoCR will vary based on the operations of the particular institution. Resource categories with extensive activity may be better explained in the notes so that the face of the SoCR does not become overly cluttered and difficult to follow. 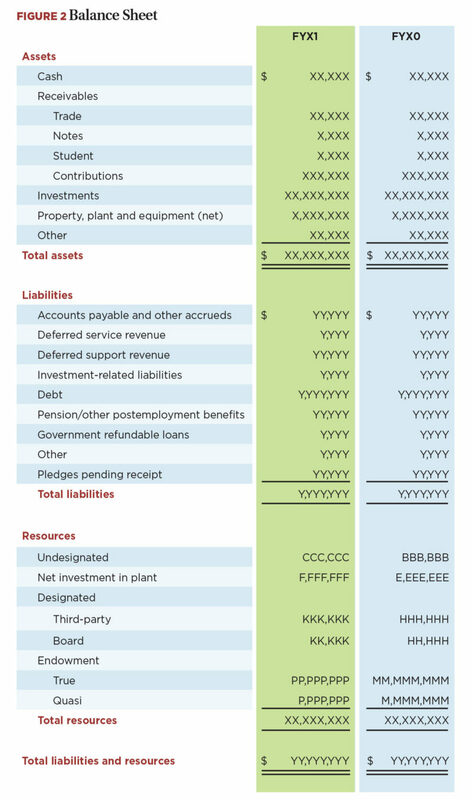 For example, although the “Investment in plant” section in Figure 4 is fairly condensed, an institution with significant plant assets and related debt liabilities would likely provide greater detail in its SoCR or elect to disclose the detailed activity in the notes. Given the level of detail provided by the statement of changes in resources, it was unclear to the team whether a cash flow statement was even necessary. Some team members felt that the operating section of the cash flow statement, if prepared using the direct method, could provide valuable trend data. If a statement of cash flows is presented, the operating section should articulate to the income statement and be prepared using the direct method. Cash used in operations would include the cash portion of the endowment payout used in operations. All other cash flows would be considered nonoperating. There would be no breakout between investing and financing activities. Disclosure overload has been a topic of concern and discussion for both public and independent institutions. With that in mind, the team focused on those disclosures that would be most helpful in answering the questions financial statement users ask. These include additional information about liquidity, including investment maturity schedules; how students pay for college; sources of financial aid; and mission-related (functional or programmatic) expenses. Order the notes to follow the lines on the financial statements, starting with the balance sheet. Include policy disclosures with the relevant note (for example, accounting policy for investments included in the investments footnote). Place at the end of the notes section accounting policies for which there is no separate footnote (use of estimates, tax status, and so on). 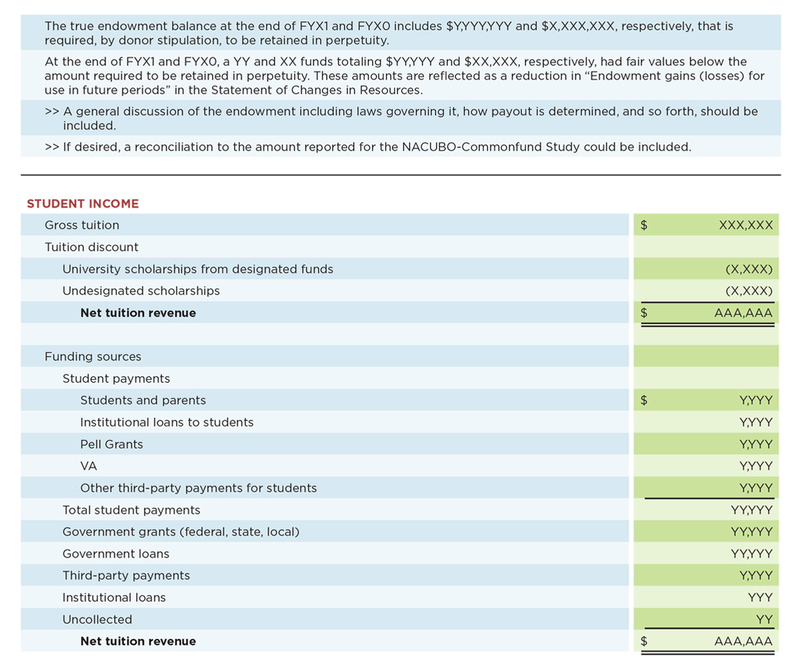 Figure 5 shows additional detail on sample footnote disclosures related to liquidity, endowment, and student income and financial aid. We can’t stress enough that the statements and related reasoning proposed by the Blank Slate team are not required. Rather, the examples are intended to stimulate conversation for those inside and outside higher education. In 2014, FASB will continue contemplating NFP reporting improvements, GASB is revisiting its landmark statements 34 and 35, and the White House will press forward on college affordability and transparency (see www.nacubo.org/Initiatives/Legislation_and_Congressional_Relations/Legislative_Updates/NACUBO_Responds_to_White_House_College_Affordability_Plans.html). Because higher education business officers are in the best possible position to inform changes on the horizon, the Blank Slate work will become part of a process designed to help NACUBO advocate for meaningful solutions. 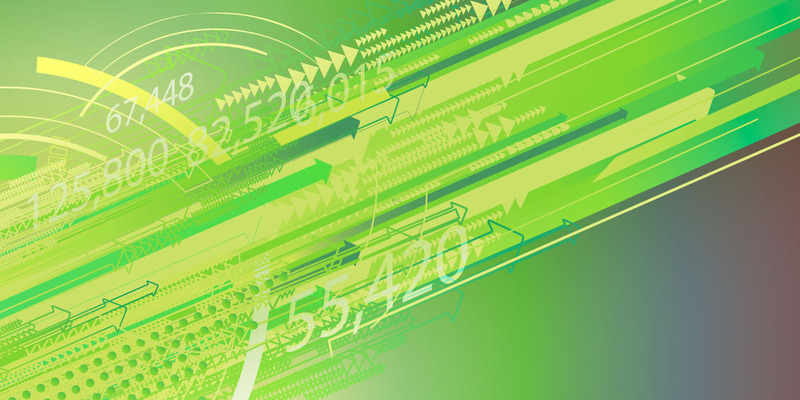 At the time this article was going to press, the FASB had made several tentative decisions related to an operating measure, net asset classes, and cash flows—and was discussing the possibility of new functional or programmatic expense reporting for all NFPs. You can read more about FASB’s preliminary conclusions at www.nacubo.org/accounting. Meanwhile, throughout 2014, NACUBO staff and its Accounting Principles Council will continue to spearhead the conversation on higher education’s financial performance needs and possibilities. Volunteers working on the Blank Slate Project are members of NACUBO’s Accounting Principles Council, an advisory group that supports association accounting guidance and advocacy efforts. Those currently serving on the APC are listed below, with Blank Slate team members appearing in bold. 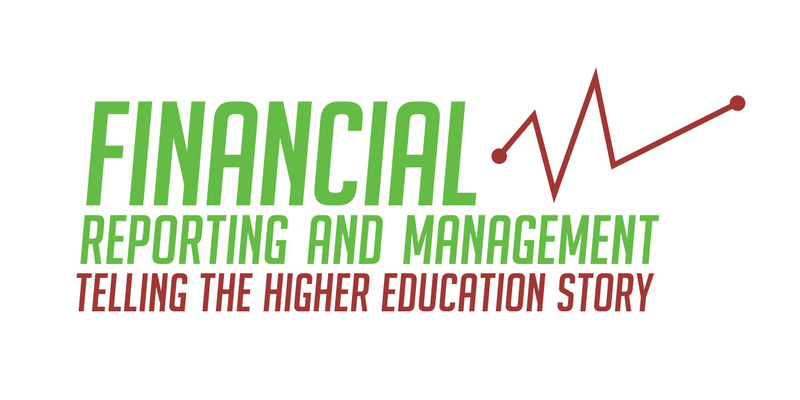 The 2014 Higher Education Accounting Forum will be held April 27–29 in Minneapolis. This popular event offers the latest information on trends, issues, and best practices in financial accounting and reporting, and managerial analysis and leadership topics, for all types of institutions. Designed for advanced-level accounting and finance professionals, the event features plenary, concurrent breakout, and roundtable formats. Several facilitated roundtable sessions will focus on technical accounting and management topics—bringing together participants with similar interests to exchanges ideas and network with colleagues and speakers. This forum serves as both an annual update and future outlook, where participants hear and engage in discussions on timely subjects affecting the higher education community. In addition to a keynote session from ethics expert Bruce Weinstein (NACUBO’s 2014 Leadership Series speaker), attendees will hear from Sue Hammersmith, president of Metropolitan State University, St. Paul, Minnesota, who will discuss business challenges faced by higher education. Other program topics address tax issues, pensions, responsibility center management, financial reporting and disclosures, international operations, compliance risk, health care, what’s happening in Washington, sustainability, analytics, and more. There will also be updates from FASB staff and the new chair of the GASB, David Vaudt.